Template ZT Darki has developed an adaptive design and design group ZOOTemplate. A characteristic feature of the template is an original design in the style of Metro and plenty of opportunities and options. Setting menu template has its own unique feature, namely all menu items can be assigned its own color control panel endowed with a great amount of items and sub-control and tuning, along with fine-tuning of the main page. The template has the ability to use more than 500 fonts, and an unlimited number of color combinations to all the main elements of the site. 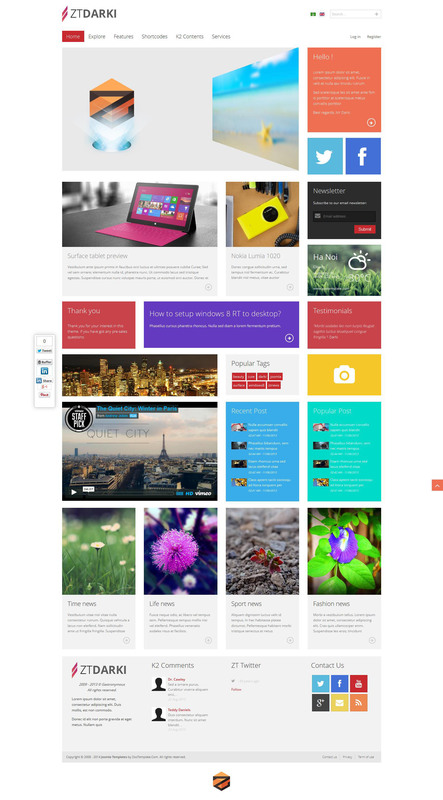 This template will make any entrepreneurial or corporate business website, a personal journal, blog or news portal.